The Newsstand ‘application’ isn’t really an application at all; it’s essentially just a stylized folder which stores the latest updates to your favorite news sources. Since it is a folder, anyone that’s used folder management in iOS will know that you can’t nest a folder within a folder, but someone over at The Coding Massacre has found a way to do just that. 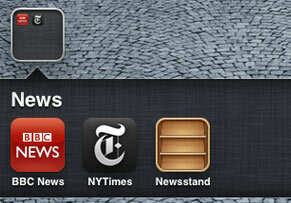 To put Newsstand into a folder you need to be quick. The work-around requires a new folder to be made, so take any two apps and place one upon the other to create one. While the new folder is being made, this is your chance to get Newsstand out of sight. As the new folder is being created you will need to quickly drag the Newsstand icon into the folder. If you are quick enough Newsstand, will go into the folder, and the job will be done. This simple straightforward tip will work with any other folder, too so you can now place any folder into another — handy! It’s worth noting, however, that with Newsstand (or any other folder) placed within the newly created folder it will no longer work. Open Newsstand in another folder, and your iPhone will restart. To get Newsstand (or other folders) working again, you will need to drag the wooden folder out back on to a top-level screen. thanks! that was brilliant! i thought i was clever…but you! Thank YOU! I like the clean, organized, private look. And newsstand was an iSore for the lack of functionality and space it took. Thank you! :) awesome, I did it! Worked a treat! Love you crazy people who work out crazy ways to deal with crazy things crazy Apple puts us crazy people through! Great job! I watched the video… and what you did is pretty much exactly what was explained here. Thanks for the visualization, I guess? Yesssssss! That just made my day! i just fell in love with you for posting this. thanks for the cool tip! Thanks – took me few tries, very cool! I’d like to know how do they expect us to want to use newsstand when in most cases the digital subcription is just as expensive as the physical one? Seem backwards, no? I’d like to know how to get NY Times and Vanity Fair OUT of the newsstand. Anyone tried syncing since then? Mine restored from backup without asking and I lost all my photos/music I’d put on there since the last time. I did this on my iPhone 3GS After I got it in the folder I clicked on newsstand and it caused my phone to go black for a second and then the lock screen came up. 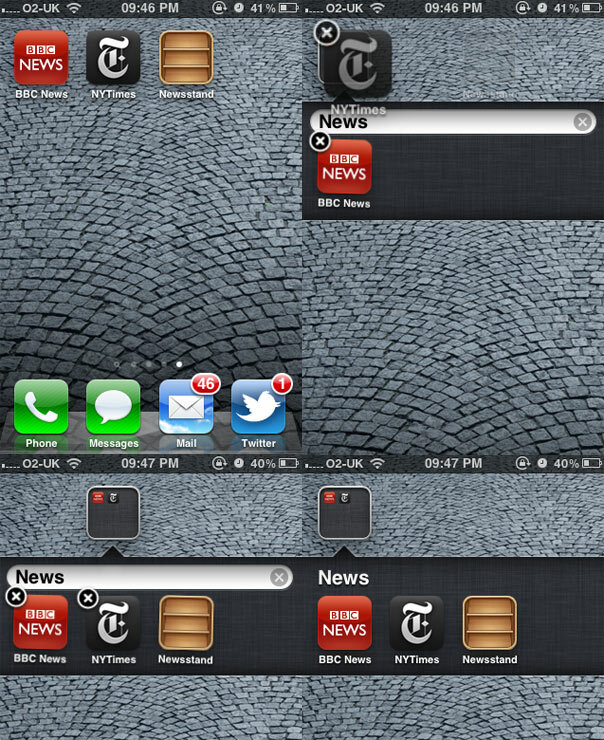 I’m not sure newsstand liked being in a folder. As I mentioned in the story, with Newsstand (or any other folder) placed within a newly created folder it will no longer work. Open Newsstand in another folder, and your iPhone will restart. Your right, Newsstand doesn’t like being put in a folder, so take caution folks! It doesn’t make it restart. Instead, it resprings. What a neat little way of respringing without jailbreaking! Lol. I have a tethered jailbreak as I type this.